It is well known fact that the rate of industrial growth of any country is a function of the amount of energy available in that country and the extent to which this energy is utilized. The burning of fossil fuels to generate energy is a dirty process. Greenhouse gas (GHG) emissions result when fossil fuels are produced and consumed and these emissions contribute to climate change. Nigeria as a country is highly vulnerable to the impacts of climate change because its economy is mainly dependent on income generated from the production, processing, export and/or consumption of fossil fuels and its associated energy-intensive products. Hence, it is on this premise that this paper is researched to review the energy sources being used in Nigeria and investigate its impact to climate change. Findings reveal Nigeria's over-dependence on fossil-generated energy with associated adverse environmental effects, among other things. Recommendations for the integration of renewable energy into Nigeria's energy mix, beyond other measures, have been offered, especially with reference to the salient environmental benefits that accrue to it. Energy is an essential ingredient or tool for socio-economic development and an index of prosperity in any nation (Akuru and Animalu, 2009). It is one of the basic requirements of human society and vital for human life and for technological advancement. In general, energy can contribute to widening opportunities and empower people to exercise choices. The place of energy and power in the sustenance of economic activities, and their contribution to the standard of living cannot be overemphasized for any nation. As a result, the demand for energy today is far greater than ever in our highly technological world. In Nigeria, energy is the mainstay of growth and development because it serves as a tradable commodity for earning the national income, which is used to support government development programs (Sambo, 1997). Due to population growth, inevitable industrialization, more agricultural production and improving living standards, Nigeria needs more energy to meet the rising demand. It also serves as an input into the production of goods and services in the nation's industry, transport, agriculture, health and education sectors, as well as an instrument for politics, security and diplomacy. The energy chain to deliver these cited services begins with the collection or extraction of primary energy, which is then converted into energy carriers suitable for various end-uses. In an earlier paper (Akuru and Okoro, 2010), the statistics of energy and its contribution to Nigeria's GDP has been set forth, though these values could increase if over 90% of energy used by rural dwellers is accounted for. Currently a high proportion of Nigeria's total energy output is generated from fossil fuels such as oil and coal. In general, the quest for an option to conventional power schemes for extension to remote and rural locations of developing countries like Nigeria arises from the high costs associated with the extensions, as well as the maintenance, of the power grid system to rural areas. This has led to a considerable interest in the development and application of renewable energy resources. Interest in renewable energy has traditionally grown from the need to expand energy resources to reach remote and rural locations. However, the use of conventional sources and fuel-wood to generate energy has continued to generate dire environmental consequences. Renewable energy is that form of energy obtained from sources that are essentially inexhaustible, unlimited and rapidly replenished or naturally renewable such as wind, water, sun, wave, refuse, bio-fuels etc. Nigeria is endowed with sufficient renewable energy resources to meet its present and future development requirements as well as complement its current oil-dependent economy (Akuru and Okoro, 2010; Nigeria's First National Communication, 2003). Greenhouse gas (GHG) emissions are produced when fossil fuels are produced and consumed and these emissions contribute to climate change. 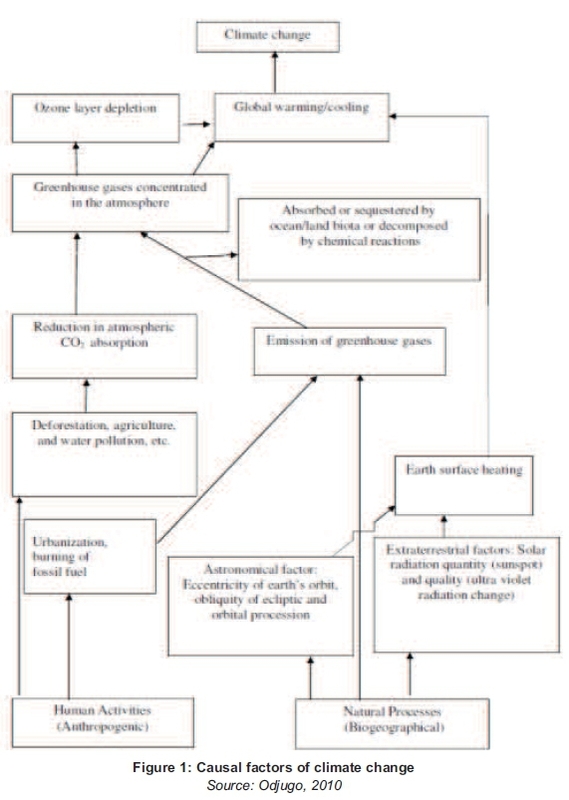 Climate change is caused by two basic factors (Odjugo, 2010), which include natural processes (biogeographical) and human activities (anthropogenic) summarized in Figure 1. Nigeria as a country is highly vulnerable to the impact of climate change because its economy is mainly dependent on income generated from the production, processing, export and/or consumption of fossil fuels and associated energy-intensive products Nigeria's First National Communication, 2003). It is well established that the activities of developed nations are mostly accountable for climate change, but developing nations are those suffering more due to inability to cope as a result of poverty and low technological development (Odjugo, 2010). Adefolalu et al., 2007; Odjugo, 2010). Other independent studies have linked climate change with the economy (Yahaya et al., 2010) and global warming) of Nigeria (Odjugo, 2011). The spill over effects of climate changes are increasing temperature (global warming), sea level rise leading to population displacement as well as land disputes, draught and desertification, unpredictable rainfall with negative impacts on agriculture, human health problems, etc. On the other hand, the visible effects of climate change have resulted in setting up measures to address it. Such mitigation options include emission cuts, reduction in water pollution, afforestation and sustainable energy investments (Odjugo, 2010; Odjugo, 2011). Based on the comparative impacts of climate change at regional levels, this paper is an attempt to review the dire consequences of Nigeria's over-dependence on fossil-fuel-based energy resources and its impact on climate change and propose a viable alternative into its energy mix. a) To what extent are fossil fuels being used in energy production and associated activities in Nigeria? b) What are the indices used to measure the impact of climate change and to what extent has/could it affect Nigeria? c) What proactive measure(s) need to be taken to address the possibility of a negative impact assessment? The impacts of climate change in Nigeria in the coming years are expected to result from global changes in climate. This change will in turn be based on increases in the concentrations of the greenhouse gases including carbon dioxide, methane and nitrous oxide. Increasing concentrations of greenhouse gases in the atmosphere enhances the potential of the atmosphere to conserve heat and therefore bring about global warming. Thus, increases in the concentrations of the major greenhouse gas emissions within the country is a function of the emissions of these gases and will depend, in the main, on increases in the consumption of fossil fuels, among other factors. In other words, expected global climate change will depend basically on global population increases, global energy consumption, and global changes in land use pattern (Nigeria's First National Communication, 2003). Rich-income countries can be blamed elaborately for greenhouse gas emissions but not exclusively. This is because even if drastic efforts are made by the developed world to reduce greenhouse gas pollution, there is even a greater risk that greenhouse gas emissions in the developing world if unabated, would translate into worsening rates, caused by rapid industrial growth, in a not distant future (Odjugo, 2010). Thus, the methodology adopted here, though qualitative, relies heavily on secondary data consisting mainly of existing records and documentation in various forms including data both from the energy sector in Nigeria and the National Population Commission and other sources relevant to the study. The general approach was to reuse mostly the results of the available data that have been previously published and model them to suit the objectives of this research. The various data sets were then analysed and the results interpreted and resolved into presentable formats using tables, charts and graphs. 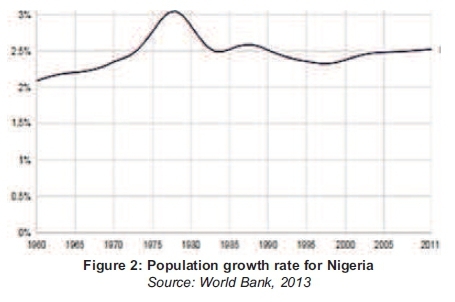 The rate of population growth in Nigeria is summarized in Figure 2. Energy Consumption by Source is the total amount of primary energy consumed from the usage of a specified fuel. Primary energy includes losses from transportation, friction, heat loss and other inefficiencies. Specifically, consumption equals indigenous production plus imports and stock changes, minus exports and international marine bunkers; the IEA calls this value Total Primary Energy Supply (TPES) (Earth Trends Country Profile, 2003). Table 1 provides details for the distribution of energy source and the amount consumed in metric tons equivalent of oil in Nigeria. All energy consumption values presented here are calculated and reported by the International Energy Agency (IEA) based on an energy balance methodology using metric tons of oil equivalent (toe) (Earth Trends Country Profile, 2003). 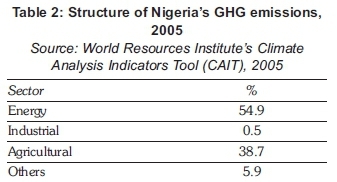 Since greenhouse gas (GHG) emission lead to climate change, data on key indicators of GHG emissions in Nigeria are shown in Table 2 and a further breakdown of the components of the energy sector is provided in Table 3. 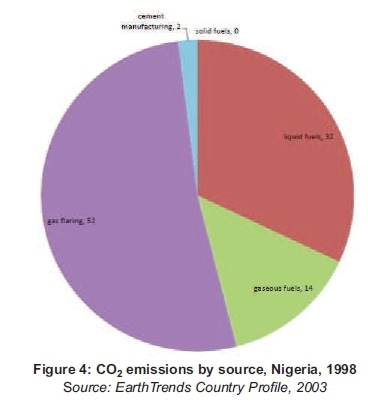 The total amount of GHG emissions for Nigeria is further broken into its three major gas types which include methane (CH4), Carbon dioxide (CO2) and Nitrous oxide (N2O), with the emission profile showing CO2having 33% from the total emission as at 2005, second to N2O with 50.8% (Nigeria and Climate Change Road to COP15; Ogunlowo, 2013). CO2 which contributes to the bulk of emissions from the energy sector, based on fuel combustion and other related processes, is expected to increase as Nigeria becomes more industrialised at the rate of over 3 Mton per year. The key drivers of CO2emissions have been linked to population, economic activity and the CO2intensity of the economy (Nigeria and Climate Change Road to COP15). Table 4 is therefore extracted to account for these dependencies. The link between population and energy has been reported in two phases (Darmstadter, 2004). The first link relates to levels and changes in economic development approximated by income or gross domestic product (GDP) per capita. In this case, as income per capita rises, so does per capita energy use. The second link on the other hand, stresses that even at comparable levels of per capita GDP, the volume of energy use will differ among countries and regions, depending on the structural characteristics of the economy, spatial features, climate, fuel prices, government policies, and others. Normally, a country's growth rate is a factor in determining how the infrastructural needs of its people are produced and consumed. To this end, the pattern on Figure. 1 shows that Nigeria's population has risen steadily from an estimated 2.1% in 1960s to about 3% in recent times. Though there was steady decline in the 1990s, the rate is still very high. Quantifying the linkage between changes in population and energy consumption, three broad factors go into the determination of changes in total energy use. These items are expressed in Equation 1 as percentage changes (Darmstadter, 2004). 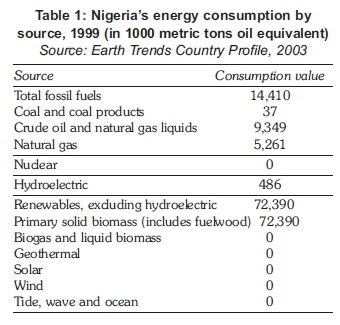 Using the data presented in Table 5, the energy consumed in Nigeria for 2011 is approximately 17.56%. This result shows that there is an active relationship between growth in population and energy use. To extend the result in Table 5, the extent which energy is used can also tell on the environmental impact. An increase in energy use will mean that the threat from climate change and other environmental degradation, especially from a fossil-fuel based economy, will become aggravated. 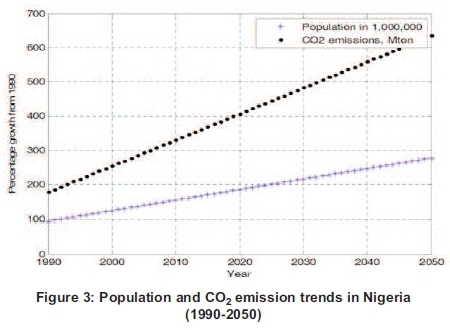 Table 4 shows explicitly that CO2emissions in Nigeria have increased over the years based on the current trend. The information provided has been used in Figure 3 to forecast what the trend would be by the turn of this century. Nigeria has its economy to be largely crude-oil based and with a teeming population growing at an average of 2.7%, it is anticipated that in the coming years, CO2emissions will significantly increase. In considering CO2emissions from combustion only, 158.42 million Nigerians were responsible for emitting a total of 54.90 Mt of CO2 as at 2010 (2012 Key World Energy Statistics). 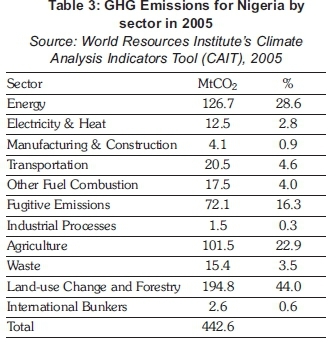 CO2 emissions by sources and sector for Nigeria are summarised in Figures 4 and 5. This shows the country's huge reliance on conventional energy sources as a large part of the country's emissions emanate from gas flares, which results from burning of gases released in the process of petroleum extraction. Similarly, the sector with the greatest amount of emission is the transportation sector, largely operated on processed fossils fuels. The content of renewable energy deployment in Nigeria is abysmal. Renewable energy is available in abundant potentials however; integration into the energy mix has been sluggish and disproportionate. From Table 1, it is evident that renewable forms of energy practically do not add to the country's energy mix despite the fact that Figure 4 reveals its zero emission characteristics. E = is emission of pollutant I from the consumption/production of a product whose quantity is represented by an activity (A) index and F is the emission factor for the pollutant i (emissions per unit activity A). The total emission of pollutant i for each process is then added over the total number of similar and diverse process k (sectors and sub-sectors), as well as over spatial grids of interest. An emission inventory therefore aims to obtain accurate estimates of the unknowns A and F for each sector and generic sources. The values of A per sector in any country are obtained from available published national data. For the energy sector, emissions may be provided through the top-down (TD) method which provides aggregate emissions based on certain factors such as production, imports, exports etc. of primary and secondary fuel without details of sectoral fuel use. The expressions for the primary and secondary fuels are given in (3) and (4) respectively. Cais the apparent energy consumption by fuel type; P= production; I = imports; E = exports; 1MB = international marine bunkers; SC = stock change for both primary and secondary fuels. It is also shown in (5) that the aggregate emission of carbon from all fuels is based on the fuel carbon content, heating values, oxidation fraction and production/consumption data. Ec is the aggregate emission factor in Gg-C, is the apparent energy consumption in PJ and is the carbon emissions factor in tC/TJ. The Intergovernmental Panel on Climate Change (IPCC) provides a more accurate method for national GHG inventory based on the bottom-up (BU) approach for the energy sector which provides techniques for emission factor estimates for all subsectors processes based on the downstream energy technologies and technology efficiencies. Emissions from BU are based on the application of (5) to each downstream energy technology. The results obtained applying these methods confirms that gas flaring, transportation and electricity generation (Figures 4 and 5) are the most significant energy consumption processes in Nigeria leading to GHG emissions (Nigeria's First National Communication, 2003). Also energy and land use sectors (Table 3) were observed to be the main contributors of CO2to emissions. Again, these emissions are still low when compared with those of industrialised countries. 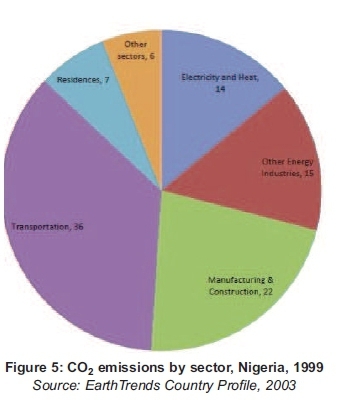 Having established an increasing population and that the content of Nigeria's energy mix is fossil fuel based with commensurate propensity to emit CO2- a by-product of GHG - there is a high risk of climate change happening already, and continuing if unabated (IPCC/OCED, 1991) Climate change impacts development the same way population and energy do. Nigeria is highly vulnerable to negative impacts of climate change along its large coastal territories, such as, degradation of agricultural lands, desert encroachment, depleting water resources and low agricultural output among others. For instance, with the majority of Nigerians surviving on agricultural proceeds, the effect of climate change on rainfall makes it vulnerable. However, this research has primarily focused on how much the current energy mix in Nigeria has impacted climate change. The findings so far are that Nigeria is dominated by fossil fuel energy sources which have made it vulnerable to the adverse impacts of climate change. In general, the exploration of petroleum resources in the last 40 years has resulted in massive injection of hydrocarbons into the atmosphere as well as considerable environmental problems (Winkler et al., 2007). In this regard, this has led to higher demand for electricity, changing patterns in hydroelectric power facilities, as well as, destruction of existing power facilities. 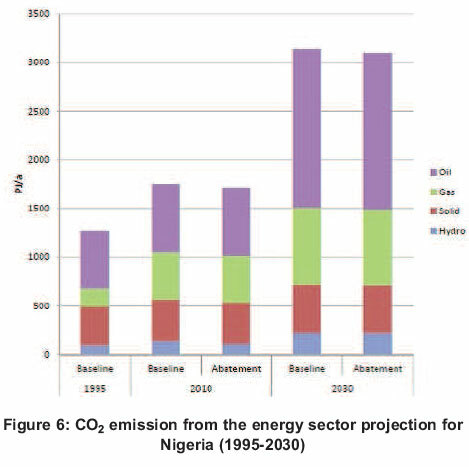 Nigeria's GHG emission is at variance with that of developed countries, where it is mainly from fossil fuels (Nigeria and Climate Change Road to COP15). There is equally large contribution of GHG emissions from the agricultural sector as shown in Table 3. Much of the emissions from the energy sector come from gas flaring (see Figure 4). Again, the results from Table 3 which accounts for estimates in emissions from land use and forestry, shows the greatest percentage for emissions from land use at 44%. 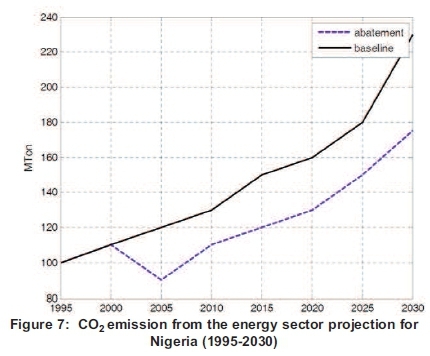 It can be argued though that the emissions of GHG in Nigeria is generally low based on available data, but as Nigeria becomes more industrialised with time and with a high population growth rate, the figure is expected to rise drastically based on the estimated values presented in Figure 3, if nothing is done to checkmate the trend. The need to tackle the negative impacts of climate change in Nigeria is apt because of its devastating long term effects on the environment and economy. Already, this paper has revealed that energy plays a dominant role in the Nigerian economy and its dominance is expected to increase as population increases and as the industrial sector expands, which are bound to happen, the corresponding effects lead to climate change. It is identified that the key institutional factors that defines mitigation capacity include effectiveness of government regulation and carbon cuts, education and skills, public attitudes and level of awareness (Nigeria and Climate Change Road to COP15). To this end, mitigation options can come as economic capacity, extensively highlighted in reference awareness (Nigeria and Climate Change Road to COP15), and resource management, the former cited as being more critical to the reduction of GHG emissions (Winkler et al., 2007). The opportunities for Nigeria to tackle climate change by adapting to clean energy projects is notwithstanding very substantial to emission reduction and spiced with great potentials. For example, specific clean energy technologies have been identified in the power, industry, transportation and household sectors, though with minimum public awareness and weak institution. In Nigeria's energy policy, the integration of renewable energy is highly encouraged; however, there are no strict regulations, targets or projects to realize the general policy (Akuru and Okoro, 2010). The GHG emission scenario for the energy sector alone is projected as shown in Figure 6. In this case, only total CO2 emission is considered. The total emission in 1995 was 110 and is expected to rise to 230 Tg CO2 by 2030 in the base line scenario, at an annual average growth rate of 2.86%. From the abatement scenario, the cumulative reduction from baseline is 975 Tg CO2. The impact of abatement is further reflected in Figure 7 where projections for the total primary energy consumption for Nigeria have been captured. By 2030, abatement is projected to increase the overall contribution of hydro to energy supply from that of the baseline scenario. The total energy consumption which was 1270 PJ and 1718 PJ in 1995 and 2010 respectively is projected to 3140 PJ in 2030 in the baseline scenario. The current structure of electricity in Nigeria is from gas and hydropower. Also, a considerable amount is also derived from diesel and fuel oil, while private generators are being run on gasoline and diesel. Hydroelectricity which is renewable has a lot of potentials in Nigeria's energy mix and Figure 7 shows this advantage in the abatement case of the projected hydroelectricity rise from 6% in 2010 to 7% in 2030. This increase is substantially based on its absolute contribution to the energy mix. This is an increment of 111% for the 2010 abatement case. To quantify the projected emission reduction potential, a simple formula, equation (6), called the aggregate reduction potential has been developed to measure the technical potential of any mitigation measure (Nigeria and Climate Change: Road to COP15). E0= annual emissions at year 0. Worth mentioning is the fact that whatever climate change projections that are available at the moment are subject to uncertainties between two extremes - some of the most recent findings are established facts or robust findings, while others are regarded as speculative (IPCC, 2000). Thus, whatever climate change projections that are available at the moment are subject to uncertainties. In summary, Table 6 presents an assessment of some of the results of mitigation as discussed here. From the result, it is evident that some of the options can be implemented at a net negative cost. 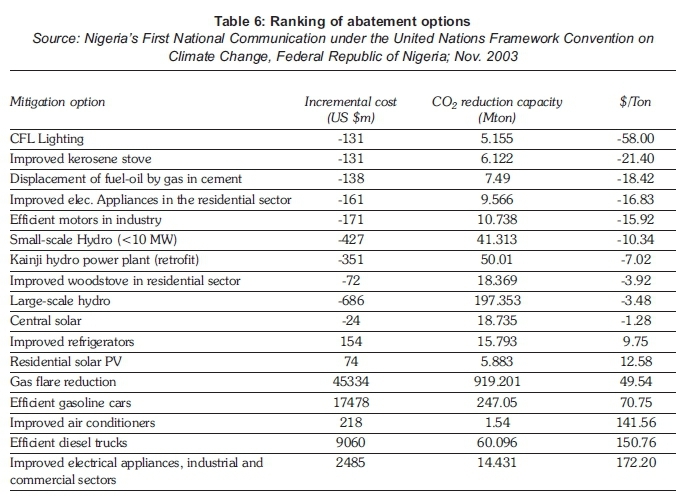 Moreover, based on incremental cost per CO2removed, it is observed that renewable energy options promise a significant impact in the Nigerian energy system; therefore, the suggestion is for an action plan to revisit Nigeria's energy system by deliberately and systematically integrating renewable energy into the country's energy mix beyond other measures discussed. It is true that it is impossible for man to stop the natural causes of climate change (Singer and Avery, 2007); however the human causes can be stopped or drastically reduced with the right approach. It is noteworthy to point out that a number of human activities have contributed and are still contributing to the depletion of the ozone layer, which causes global warming. This paper has been written to highlight a number of these human activities and how it is contributing to climate change in Nigeria. Currently, Nigeria's energy sector is fossil fuel dominated and its associated processes lead to GHG emissions and ultimately, climate change. If the current trend is unabated, then climatic variability currently being experienced is definitely going to increase and intensify and the resultant impact will be catastrophic for the future of the country. The case that Nigeria's contribution to global warming is insignificant when compared to that of developed countries is unsupported given the current trend that threatens to spare no one. Hence, this paper has attempted to correlate using certain indices, the disturbing extent to which climate change is affecting Nigeria. The results reached on the proliferation of climate change via Nigeria's fossil-based economy is very revealing and so requires urgent mitigation actions and proactive measures of which the deployment of renewable energy into the country's energy mix has been advanced amongst other things. To this end, the Nigerian government should induce the deployment of renewable energy sources in stand-alone capacities as well as grid-based to boost energy security and its availability. To reduce the emission of GHGs, clean and environment-friendly technologies are required. Automobiles can be upgraded to operate on modern fuels such as ethanol, solar engines, electric or hybrid engines. Gas flaring being perpetrated by oil producing companies should immediately be halted, harnessed and defaulters made to pay penalties where necessary. Regulators of the energy sector should encourage operators and consumers to adapt to or adopt energy efficiency measures in both the supply and consumption of energy respectively. International frameworks are to be pursued so as to force developed countries to implement vis-à-vis strengthen vital global treaties such as the Climate Convention and Kyoto Protocol. Such actions to encourage policies like the clean development mechanism (CDM) is another avenue through which large-scale investments can be attracted into the country for financing clean projects and in return grant carbon credits to developed countries. In the main, the supplementary benefits of turning to renewable energy resources are improvement of current abysmal condition of employment of tertiary graduates by creating jobs, opportunities for new investors, economic improvement, sustainable energy development, environment-friendly technologies and health advantages.